From Mark Naison – Parent Strike! Every post I get from around the country suggests that the attack on teachers, students and public education shows no sign of letting up. Students are being tested more than ever; great teachers are being given low ratings and driven out of the profession; and whole cities are being turned into all charter districts without evidence that this will do anything to empower students, while at the same time funneling profits to consulting firms and real estate developers. While the worst of the attacks are hitting high poverty schools, no districts are immune from the scripting, the micromanagement and the obsession with test results. This nightmare is occurring in states with Republican governors and states with Democratic governors. Anyone who thinks that the new ECAA legislation being passed by Congress is going to bring relief is being extremely naive. Those who think than any Presidential candidate will make things better is living in Never Never Land. The momentum of current policies on the state and local level is powerful because it is driven by Billionaire dollars. The same people who are controlling the political process in DC are driving privatization and profiteering in public education at the local level. The only way to fight back against this is civil disobedience. Parent strikes, Student strikes. Teachers strikes. Test Refusal. And innovative tactics to bring the pressure on those who would destroy students lives and teachers careers. Disrupt meetings. Picket peoples houses. Make those who would make students and families pay the price pay a price themselves. This is why I am very excited about the formation of the group ParentStrike. And the refusal of United Opt Out to compromise at all with ANY federal legislation that uses standardized testing as the basis of school evaluation and uses federal funds to punish schools, school districts and entire states on the basis of test scores. Our children and grandchildren deserve better. Much better. My apologies for not keeping up with this. 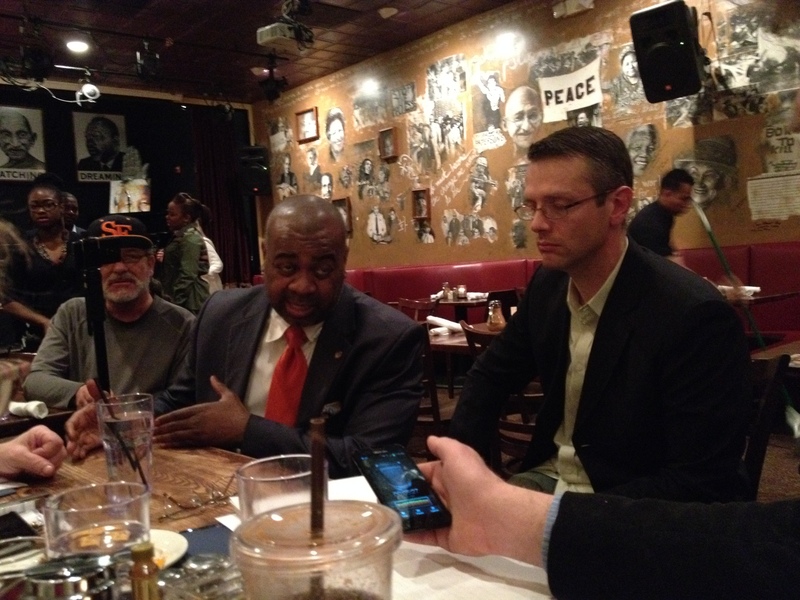 I was able to record parts of the remarks of Ras Baraka (a progressive candidate for mayor of Newark, New Jersey)’s remarks at Busboys & Poets this past weekend, and I was going to attempt to share them with you here, but ran into some sort of snag, so I’ll have to give you the links on Google Drive instead. My recordings are in four unequal parts, and are in iPhone’s ‘voice memo’ format. The first one is quite short, less than a minute. The second one is rather long, and is quite a rouser. Among other things, he points out that a victory against racism and oppression in one location encourages others to fight back harder and win. In the third one, I asked him what his experiences were like as a teacher, building rep, and then principal. In the fourth one, ‘Teacher Ken” asked him how he managed to bring medical and dental services to the schools under his care. Let’s see how this works, and please let me know (via ‘comments’) what your experiences are. According to the Chicago Sun-Times, the entire faculty of Saucedo Elementary Academy, with the support of parents, have voted to refuse to administer a standardized test called the ISAT. Most of the parents have apparently already chosen to have their children ‘opt out’ of taking the test. The test administration is supposed to start on Monday, 3/3/14. The teachers refusing to administer the ISAT could face disciplinary action, CPS officials said. Chicago Teachers Union Vice President Jesse Sharkey said those teachers could be fired. “I think it would be outrageous and wrong. . . . The teachers aren’t doing this for any gain. They’re doing this because they want to teach,” he said. The CTU vowed to “mount a strong defense” if the teachers are disciplined. Chambers said teachers know this is risky, and there might be consequences from the administration. “We are not afraid. We’re standing strong for our kids and what is right,” she said. Boycotters at Saucedo hope the school is a leader in the anti-ISAT movement, which has been gaining momentum in recent days. This is a big step forward in the move against the top-down deforming of public schools (particularly those for poor children and minorities) into all-test-prep all the time. Details here, and here. and here is a youtube video!